These days it’s no secret that UX is key for your website’s success, just as today’s tech-savvy customers expect great things when they visit your site. But did you know UX design tools can improve your website’s usability at every stage in the design process? 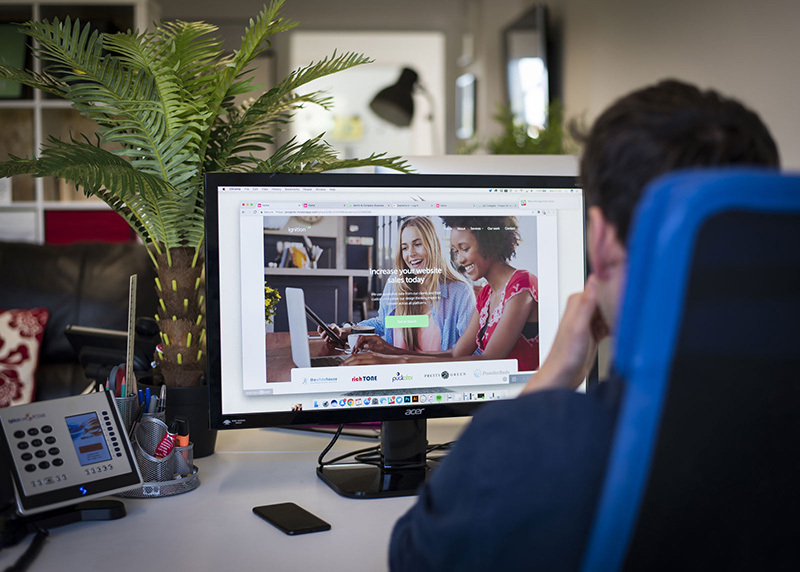 Whether you’re building a website from scratch or redesigning your existing one, UX design software will help you design a customer-focused website with more accuracy, eliminating the need to rely on instinct or guesswork. The right software will bring to light any problems or glitches much earlier in the design process, saving you the time and cost of correcting mistakes after the build. 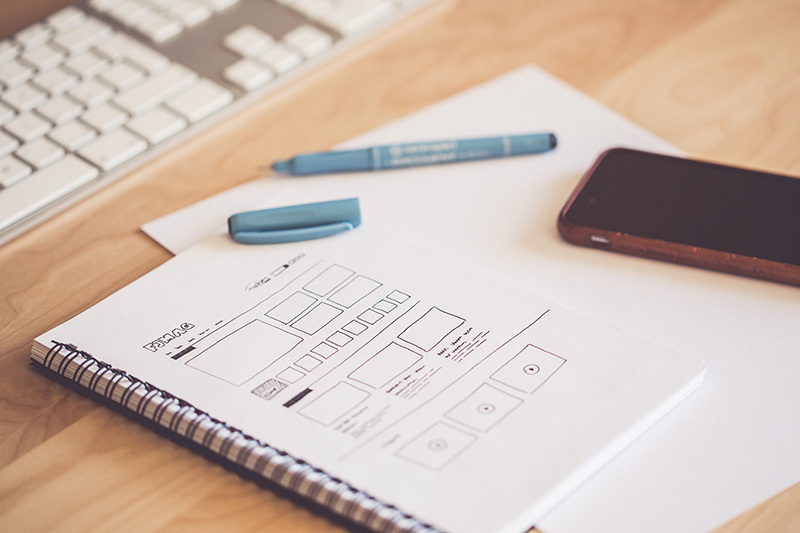 In a nutshell, use UX tools and you’ll design a better website in less time. But with so many different UX apps and software to choose from, finding the right tools for the job can be a daunting task. To help you decide I’ll summarise the key benefits of some of the best tools for each stage of designing your website, from wireframing through to usability testing. But I won’t stop there. For each stage I’ll pick my favourite, giving you a rundown of the 4 UX tools your website design can’t do without. At the start of the design process, a good wireframe maps out your website’s basic structure and customer journeys. It’s important to perfect this stage, because structural problems are harder to fix further down the line after layers of visual and functional elements have been added. With the right tool you can create your wireframe faster than manual drawing and easily experiment with different layouts. This tool is super easy to use straight out of the box. It intentionally lets you create only basic wireframes to keep you focussed on your website’s function, without being distracted by visual concerns that should come later in the design process. Balsamiq aims to reproduce the experience of sketching manually but with the speed of a computer, using drag and drop elements. It’s easy to make changes to your design so you can play with different layouts to find the one that works best. And you can save your wireframe in versions so it’s great for iteration. If you’re designing a complex or custom website, though, you may find the selection of shapes and icons too basic. At the other end of the scale, this tool from the Adobe family has more design functions for high-fidelity custom wireframing. With all the features of a basic drawing app, this tool gives you the freedom to create your wireframe in more detail. Keep in mind though, with these extra features comes the risk of getting distracted by visuals too early in the process. The XD interface is a streamlined version of other products in the Adobe suite. So if you’re familiar with Adobe, chances are you’ll find this easy to use. There’s the option to create and save symbols and elements for reuse, which is a handy time-saver. Another great feature is XD’s responsive preview option which lets you check how the structure of your site will work on different devices. This tool has been developed to give you ultimate clarity as you work, with a clean, minimal interface. Icons only appear as and when you need them, so you can stay laser focussed on each step without getting bogged down or distracted by irrelevant clutter. So this tool is ideal for fast, fluid wireframing. Like Balsamiq, it’s very simple to use, with the option to drag and drop elements to a template. While it’s strictly low-fi only, you’ve handy features like a tab to switch between screen sizes. It’s easy to turn elements on and off when you’re deciding what to include on a webpage. You can also lock, copy and paste elements with a click. Your website’s visual elements can make the right impact before any written content. But visuals aren’t just there to look pretty. They can guide the user and make key information easier to find. The best UX design tools will help you achieve this with easy-to-use effects and a broad scope of features. This shiny new design tool offers a slick, intuitive interface with lots of features to create custom visuals. It’s user-friendly, so you can get to grips with it quickly even if you don’t use design tools on a day-to-day basis. Toolbars and icons are where you’d expect to find them, and you can use keyboard shortcuts to save time. At the time of writing, though, InVision Studio is only available for Mac. And because it’s still in its infancy, this tool might be less reliable than its more established counterparts: occasionally features don’t work as expected. Figma’s often touted as ‘the Google Docs for design’ because it’s browser-based and supports multiplayer collaboration. This means you can work with others from any platform: Mac, PC, and even Chromebook, all at the same time. If you’re working on your website as a team, this feature is a big plus. While the interface isn’t as pretty as InVision Studio’s, it’s intuitive and simple to use. There’s the standard tabs, icons and menus you’d expect from any decent illustration platform, together with enough functionality to create something unique. Figma’s got a code generator option which makes handoff to your developer an easier process. This tool also excels at responsive design with its ‘size constraints’ feature, ideal if you need to create a fully accessible website for your customers. UXPin makes it easy to give your website a consistent look. There’s a handy ‘Team Library’ which lets you save elements you’ve created for reuse throughout your design, effectively generating a style guide for you. Another great time saver is the ‘smart elements’ feature. This allows you to modify an element just once, and then update it across the whole project. The tool also has some decent animation features for making an interactive prototype of your design after you’ve created it. But the interface isn’t as intuitive as the other tools I’ve listed, so there could be a steeper learning curve for non-designers. A prototype is a working model that tests how easy it will be for users to navigate and interact with your site. A good prototyping tool lets you quickly create a preview of your website that looks and behaves like the real thing. A great tool will make it easy for you to identify and fix any interaction issues before your website is built. InVision is a user-friendly tool that lets you upload image files of your webpages, then mimic links by creating ‘hotspots’ where your user would tap or click. The tool also has a good range of animated transitions, including mobile gestures. it’s easy to edit, review changes and monitor feedback as you go by jumping between the build, preview and comment tabs. But where InVision really excels is collaboration. You can leave comments and feedback at relevant points directly inside the project. There’s also the option to collaborate in real-time. If you’re part of a remote team this makes it easy to spot and resolve issues as they occur. If you’re looking for a prototyping tool that’s super-easy to use, Marvel’s a great choice. You can click and drag your way around, and it’s simple to duplicate hotspots and transitions across multiple pages. The interface uses galleries rather than drop-down menus for at-a-glance selecting. This potentially means you can build your prototype faster than the alternatives on our list. Marvel also has an extensive range of animation options to make your prototype feel realistic, mimicking both touchscreen gestures and desktop interactions. On the flip side, collaboration’s a bit more basic than InVision with the option to share and leave comments only. Proto.io really shines when it comes to advanced transitions and custom animations. So if you want a prototype that’s super-authentic, this is the tool for you. It’s also the best choice if you’re planning a unique, highly animated site and want to see how this will play out for customers. There’s a payoff, though: because it offers more complex functions than the other tools on our list, it will take you longer to familiarise yourself with the interface. And finding the right icon or element in the vast library can be time-consuming, so it might not be the fastest solution. Once you’ve built your site, there’s the vital step of analysing how real users are interacting with it. User analysis tools will give you in-depth insights into your customers’ behaviour, bringing to light any problems. They’ll also help you identify customer motives and preferences so you can tailor your site to maximise conversions. Hotjar is best known for its high-quality heatmaps. These show you at a glance what areas of your site get the most clicks and taps. The maps are colour-coded, with warm colours showing the most attention, and cold colours less popular areas. But Hotjar has a host of other features too. There’s the option to watch recordings of real user sessions. There’s also conversion funnel analysis, for insight on where customers might be dropping away from your site. You can create feedback polls, analyse contact forms, and even set up user surveys. The interface is clean and very easy to use, with consistent layout and filter options across all features. FullStory takes recording individual sessions a step further. It creates a comprehensive database of all user behaviour, highlighting overall trends, patterns and common issues. It also spots ‘rage signals’ like a thrashing mouse. This quantitative approach makes it easy to quickly identify any bugs or glitches interfering with your site’s UX. FullStory also lets you filter and customise your reports, so you can drive down on the data you need. The interface is easy to use, with graphs and pie charts available. Like Hotjar, FullStory has a heatmap feature for interaction points at a glance. But it can take time to get enough data for meaningful results, especially if your website doesn’t reel in a huge amount of traffic. This tool is very easy to install and simple to use. It doesn’t have as many features as the others in our list, but where it excels is the quality of its user session recordings. Inspectlet lets you play back user sessions without having to worry about any lags or glitches. This tool also offers customised reports based on detailed filter options, handy if you want to examine the behaviour of a certain demographic. It creates a variety of heatmaps too, including eye tracking maps to pinpoint what areas of your site customers are drawn to. I’d recommend this tool if you’re a small business looking for in-depth qualitative analysis and AB testing. When it comes to wireframing, I think wireframe.cc has the edge. 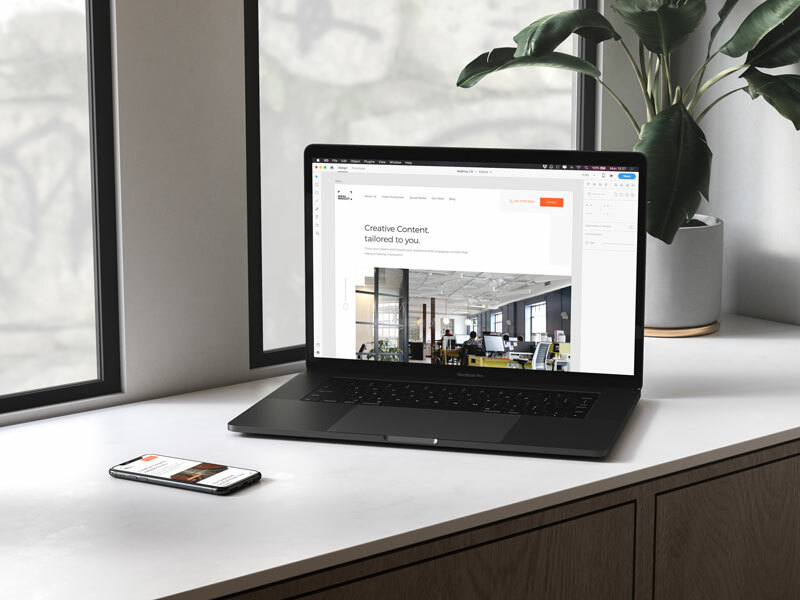 It doesn’t offer the biggest range of features, but I like the way the clean interface helps you focus on the task in hand so you can map your website’s structure without distractions. Next up, Figma wins the design category. It’s got all the features to create unique visuals but you don’t need extensive training to use it. A key benefit is Figma’s responsive design capabilities, a vital consideration for most websites today. For prototyping, Marvel gets the top spot. It’s user-friendly and lets you work with speed and accuracy. And it’s got enough features and collaboration options to create a unique, quality prototype for most websites. And the best all-round tool for usability testing? I think Hotjar wins here, because of the broad range of analysis it offers, without any learning curve needed to use it. What do you think of my choices? Is there a UX design tool you like to use that’s not on the list? Let us know. We’re always keen to hear about great tech for UX web design.